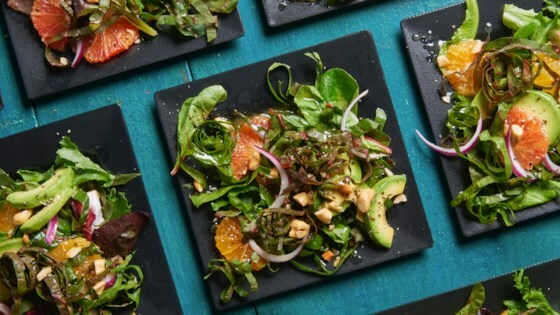 "Swiss chard and mixed greens topped with citrus fruit, avocado, red onion, and cashews and drizzled with a citrus vinaigrette. You can use any combination of citrus fruits, such as grapefruit, oranges, tangerines, or pomelos." Using a sharp knife, remove all of the peel and pith from the citrus fruit. To section each fruit, cut between the membrane and flesh of each fruit and remove the flesh. You should have 2 cups fruit. After sectioning, squeeze the leftover membranes over a bowl to reserve the juice. Combine 3 tablespoon of reserved fruit juice, olive oil, vinegar, honey, mustard, salt, and pepper in a screw top jar. Close and shake vigorously to combine. Arrange mixed greens, Swiss chard, orange, grapefruit, and clementine sections, red onion, avocado, and cashews on a large serving platter. Drizzle with dressing. I made this for a New Year’s Day potluck and it was a real hit. I used less oil and threw in some pomegranate, but otherwise kept the recipe as-is.